The Murdoch Dynasty’s London newspaper, The Sunday Times, just prints what is the official view of Her Majesty’s Government, says its Home Affairs reporter as a way to explain-away a character assassination piece on NSA whistle-blower, Edward Snowden. 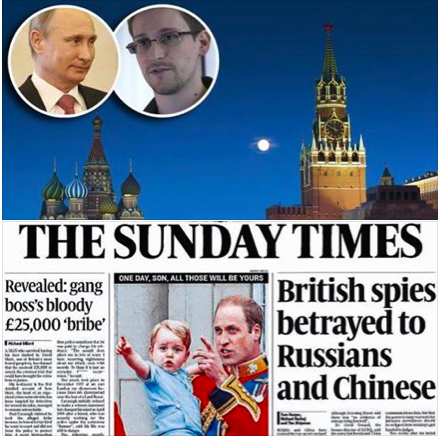 The Sunday Times front-page story “British spies betrayed to Russians and Chinese” claimed that the encrypted NSA documents stolen by Snowden had fallen into the hands of the Russian and Chinese governments. 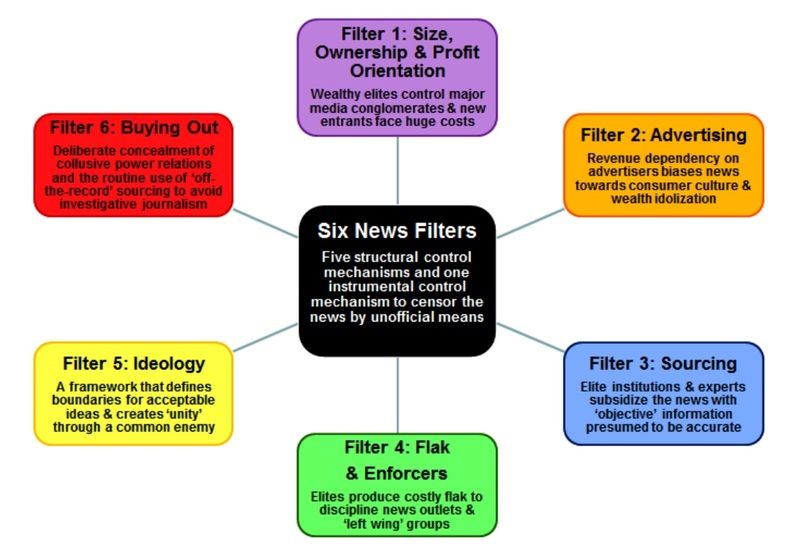 Snoopman finds that by uncritically repeating the claims of anonymous government sources, The Sunday Times has, in effect, activated the sixth filter of the Propaganda Model, which describes how the news is filtered in the absence of official state censorship. Snoopman finds that in order for News Corp-owned The Sunday Times‘ to publish the attack piece, “British spies betrayed to Russians and Chinese”, it had to pass through the Propaganda Model’s sixth filter, ‘Buying-out’, which theorizes for collusion and conspiracy in newsrooms. He rounds off by daring news outlets to expose the Deep States’ power crimes. [15 minute read. Contains traces of sarcasm]. Sunday Stenographers: The Murdoch Dynasty’s Sunday Times newspaper attempted to assassinate Snowden character, which drew limited salvos from rival media outlets. A recent Sunday Times‘ character assassination hit-piece on NSA-whistle-blower Edward Snowden provides a clear example of a newsroom conspiring with a government to attack a perceived enemy. The central claim made in The Sunday Times article, “British spies betrayed to Russians and Chinese” (paywall-free version here), is that the encrypted documents that Edward Snowden stole from the US National Security Agency (NSA) have fallen into the hands of the Russian and Chinese governments. This spurious allegation lays the shaky foundation for another unsubstantiated claim, namely that British and American intelligence operations have been compromised and their spies endangered. The Sunday Times character assassination piece, typed by ‘journalists’ Tom Harper, Richard Kerbaj and Tim Shipman, provides a clear example of the dodgy routine practice of using anonymous elite sources. The slyness of quoting anonymous official sources is that it gets the news outlet off-the-hook from doing a real investigation, backed by verifiable evidence. It also means that other news media outlets are unable and unobligated to investigate the Narrative News Yarns© being spun because the anonymously-quoted sources’ vested interests, career trajectories and place in the web of power remains untraceable. (See section below: The ‘Buying-out’ News Filter). 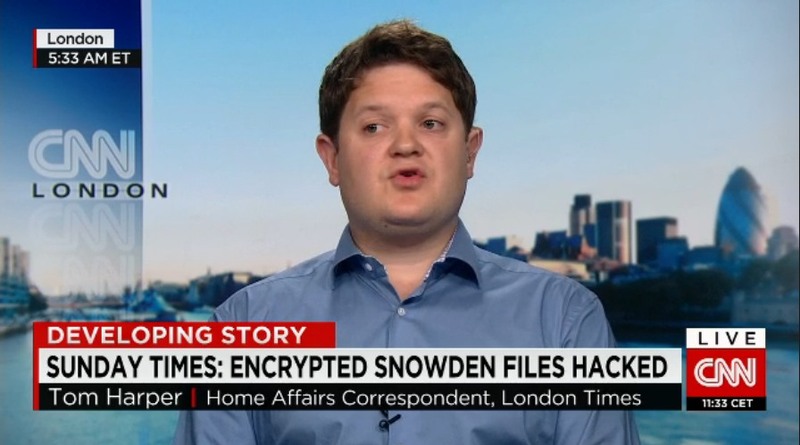 After initially being repeated as Truth by British and American news outlets and gullible journalists took to Twitter to discuss the implications for Edward Snowden, the story has since collapsed under scrutiny, as a hilarious interview by CNN with one of the reporters responsible for the story shows. (See also: Al Jazeera‘s “Behind the Sunday Times Snowden Saga“; The Guardian‘s “UK under pressure to respond to latest Edward Snowden claims” and The Globe and Mail‘s “Snowden’s lawyer slams Times story claiming leaks ‘betrayed’ British spies“; and The Huffington Post’s “Glenn Greenwald Accuses Sunday Times Of The ‘Type Of Reporting That Destroys Journalism’s Credibility’“). On the surface, The Sunday Times article was designed to vilify NSA whistle-blower Edward Snowden and justify increased mass surveillance capabilities for the British spy agency, GCHQ, which is part of the Five Eyes’ Echelon global mass surveillance network. 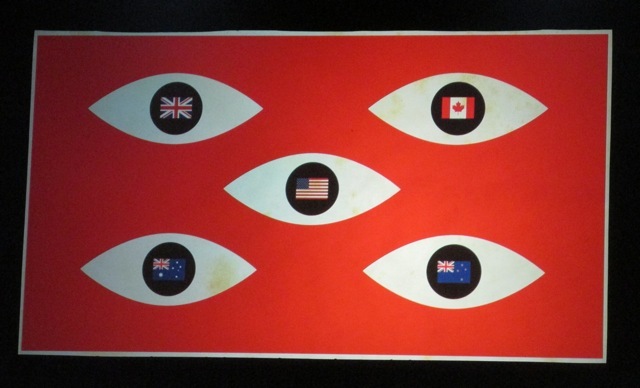 However, the ‘Five Eyes’ spy partners – the United States, the United Kingdom, Canada, Australia and New Zealand – pose a bona fide threat to the ideal of free and open societies. (See section below: Confronting the Extinction of Privacy with ‘But, Why? Questions’). All the Better to See You With: The Echelon surveillance network are the snooping eyes (and ears) of the Anglo-Saxon Deep State. 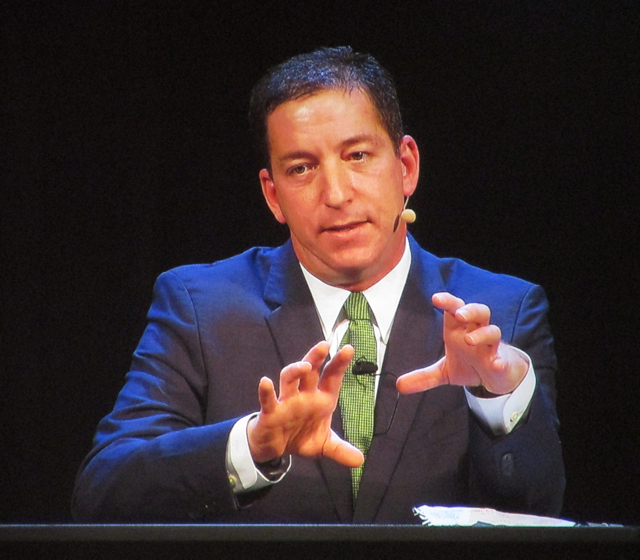 Glenn Greenwald quickly pointed out that Snowden gave the encrypted documents to news outlets for them to decide what was in the public interest to know, and to balance that mandate with not endangering lives. Snowden has repeatedly said he did not take the stolen NSA documents with him once he left Hong Kong, where he gave selected news outlets the encrypted NSA files, in case authorities seized them. Notably, the news outlets that Snowden worked with were not owned by Rupert Murdoch’s global media empire, News Corp (which owns The Sunday Times). The Creepy ‘n Spooky Show: Greenwald revealed evidence that New Zealand’s Echelon spy agency, the GCSB, is also facilitating mass surveillance of NZ’s populace on 15 September 2014 at the Auckland Town Hall, NZ. Especially when The Sunday Times‘ Home Affairs reporter, Tom Harper said during ‘four minutes of farcical fumbling’ on CNN, “It’s, it’s obviously allegations at the moment from our point of view. And, it’s really for the British Government to, uh, to defend it. We just publish what we believe to be the position of the British government”. As The Huffington Post reported, The Sunday Times‘ headline, “British spies betrayed to Russians and Chinese” contains no skepticism. Breaking! The Sunday Times admits under standard journalistic questioning that it is the Official Printer of Her Majesty’s Government. In the next section, we explore how collusion and conspiracy can occur in large news outlets on a routine basis among personnel who have likely incorporated an ideological prejudice that collusive or conspiratorial behaviour among elites is non-existent or unprovable. Filtering the News: The Propaganda Model describes how the news can be censored by unofficial means. A sixth filter called ‘Buying-out’ was added to the Propaganda Model during the course of the study, “It’s the Financial Oligarchy, Stupid” into media coverage of Global Financial Crisis and bank bailouts. Buying out here means those routine journalistic practices that result from conscious decisions to go along with the collusive milieu in which they work, socialize and live. As can be seen in the diagram above, Filter Six models for the routine use of anonymous sources. Because journalists protect their official sources with anonymity, those governments insiders cannot be confronted to challenge the veracity of their claims. The routine use of anonymous sources also creates an immediate problem for news audiences because they cannot discern who is saying what and therefore they are positioned as spectators, who cannot see the behind-the-scenes game strategies. (1) “according to senior officials in Downing Street, the Home Office and the security services”; (2) “Senior government sources confirmed”; (3) “One senior Home Office official accused Snowden”; (4) “David Cameron’s aides confirmed”; (5) “A senior Downing Street source said”; (6) “said a senior Home Office source”; (7) “A British intelligence source said”; (8) “A US intelligence source said”. These eight instances are, essentially, akin to arming the three ‘journalists’ with pistols. But, these glorified stenographers were only able to fire eight ‘live’ rounds of anonymously-manufactured ammunition at their gagged, bound and back-to-the-wall target, in their 900-word character assassination piece, before he metaphorically dropped to the newsroom floor, bleeding from fatal wounds. Breaking! The Sunday Times prints the view of Her Majesty’s Government. Indeed, the only named source in The Sunday Times’ Snowden hit-piece is Sir David Ormand, the former director of British spy agency, the GCHQ, who is obviously not currently the director of British equivalent of the NSA. The commonplace practice of using former officials as named sources satisfies the appearance of expertise, while subtly protecting the current officials from being accountable. (This phenomena was also observed in the UK and US news coverage of the Global Financial Crisis and bank bailouts). Furthermore, the dirty political attack hit-piece by Tom Harper, Richard Kerbaj and Tim Shipman did not include any counter-views. There was no attempt to be skeptical and challenge the British government sources about whether they might have hidden motives. In scathing analyses about the The Sunday Times’ Snowden hit-piece, the pattern of government’s making false accusations aimed to discredit whistle-blowers is shown to be well-established. From character assassination attacks on Pentagon whistle-blower Daniel Ellsberg to US Army whistle-blower Chelsea (formerly Bradley) Manning, to Edward Snowden, the vested interests hide anonymously and cowardly behind institutional power. Breaking! News Corp newsroom lacks scruples … conspires to fire unsubstantiated accusations from anonymous former government official at NSA whistle-blower. So, when it is recalled that The Sunday Times‘ Home Affairs reporter, Tom Harper told CNN‘s George Howell, “We just publish what we believe to be the position of the British government”, it’s important to see that there is a concerted effort to sway public opinion against Edward Snowden and manufacture the consent of the governed to accept mass surveillance. 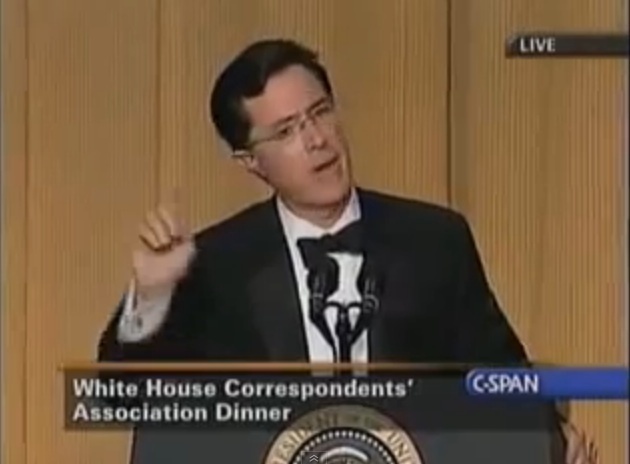 It is ironic, therefore, to find that when Comedy Central’s Stephen Colbert performed his hilarious satire before the elite of the American media, the smart folks of Washington’s political elite and former president George Walker Bush, in 2006, he made a ‘housekeeping joke’. The comedian announced that should the guests want a drink, they only needed to “speak slowly and clearly into their table numbers”, and the NSA would deliver their cocktails. Reviewing the Rules: Comedian Stephen Colbert mocked the White House press corp for typing The Deciders’ (George W. Bush) decisions down without standing up for the Make-real World. Given that the NSA’s snooping was so well-known in 2006 that it became comedic fodder, it’s tiresome to see that some commentators make the observation, however wearily, that Western governments appear to have learned nothing from Snowden’s whistle-blowing. They note that the West’s regimes are now seeking to extend their mass surveillance activities. This narrative lends itself too easily to say that it seems that Extreme News Outlets appear to have learned nothing too, because it suggests the major media cartels are merely adhering to the first five filters of the Propaganda Model. (See “It’s the Financial Oligarchy, Stupid, p. 44-48, 278). While these news filters were operational, particularly filter three, Sourcing, and filter five, Ideology, it also takes conscious decisions to grant all current government sources anonymity, and run the story with no verifiable evidence and provide no space for oppositional voices. These decisions breach accepted standards of journalism. Filter three, Sourcing, was operating since it explains why sources from elite institutions are presumed to provide accurate information. Filter five, Ideology, was also operational because Snowden is framed as an ally of the current ‘common enemy’ – Russia and China. However, in the ‘Post-Iraq-has-Weapons-of-Mass-Destruction-and-Saddam-Hussein-helped-Al-Qaeda-carry-out-the-9/11-terrorist-attacks-Era’, which was proven to be blatantly false in 2005 – as Eugene Jaracki’s documentary Why We Fight retells as an argumentative strategy to show America fights wars to benefit its transnational corporations – there is no excuse for this lack of skepticism. 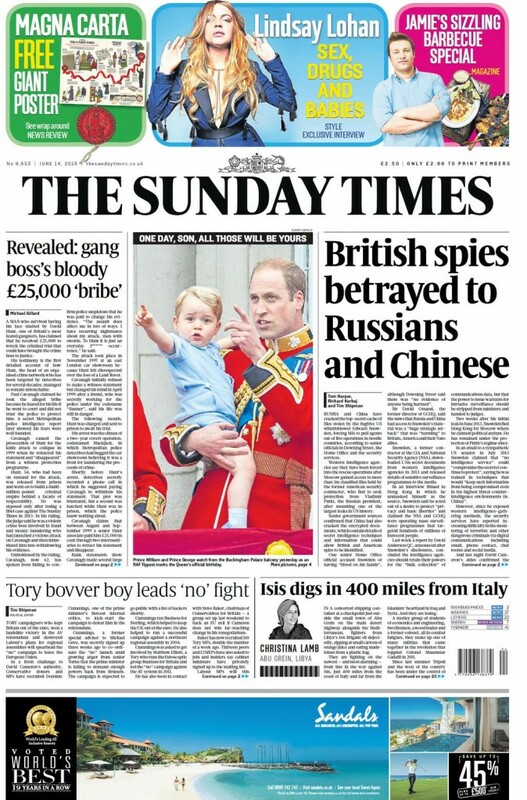 Instead, The Sunday Times headline could have read, “British spies betrayed to Russians and Chinese, claims British government … anonymously … and with no evidence”. Therefore, it’s time that Humane-Stream Media Outlets such as The Intercept, Media Lens and Z-Net asked loudly and frequently, why exactly is there this concerted effort to assassinate Snowden’s credibility? Because it is useless to reproduce standard issue banal answers like ‘the Five Eyes Spy Alliance wants more surveillance powers’, ‘states will tend toward tyranny if unchecked’, and ‘Because Terrorism’ … ‘Because American Imperialism’ … ‘Because British Empire’, like a Team America-esque Michael Moore caricature. These are blunt answers that fail to reveal the counter-historical narratives, the continuities of Deep State networks and their precise covert objectives. In other words, the world needs to know how exactly power is augmented and who exactly comprises the criminal Deep State. For that to happen, journalists need to be willing to educate themselves in public, as the founders of the Magnum Photographers collective of photojournalists saw as their duty. In short, journalists need to re-discover that childlike curiosity they had before they became scaredy-cat conformists and revel in asking serially pesky, ‘But, why? questions’. We argue that key insiders from the Western powers perceive they have no choice but to continue to advance ‘the game’ together. We contend that the trajectory the world is on is one where permanent war, replete with the use of NATO state-sponsored terrorism, Color Revolutions and Shock Doctrine-styled economic warfare, is exploited to advance the construction of corporatized totalitarian super-states. Crucial to that Global Neo-Colonial Project is the universal deployment of sophisticated propaganda. All propaganda comes packed with a metaphorical grenade, designed to evoke fear and coerce mass populaces into submission. This is the dirty secret of the Western Extreme news media. What Extreme Media Outlets™ fear most of all is that their indoctrinated mass news audiences discover the routine deployment of Propaganda Grenades® in the daily news. Inside these Propaganda Grenades® are Truth-telling Paper TigersⓅ, whose stripes are formed of words and images from the stonking books, documentaries and articles they’ve absorbed to counter the propaganda narratives of Bubble Gum TV News℠. Therefore, the linchpin to collapsing propaganda is knowing what is omitted and why, and possessing a finger with the willingness to pull that linchpin. Indeed, in a special report published in June 2014, “Missing News-action Action: Confronting Deep State Power Crimes“, Snoopman News showed that the NSA’s creation story [Best spoken out-loud with a deep Hollywood movie trailer voice] – ‘to prevent another Pearl Harbor’ – is bunk. We investigated a counter-narrative from WWII to 9/11, with NATO-Bilderberg Group terrorism in between, that has already been revealed in numerous scholarly studies, which we cited. We believe it is this counter-narrative that needs to be blown wide open if the world is to escape the intended tyranny by stealth at the hands of pinstriped-suited fascists, or elite power criminals. Their only other choice is to surrender and submit to trial for crimes against humanity, a decision that is as likely as the Queen of English Shires offering to wash ‘her subjects’ toilets to prove she doesn’t believe herself to be innately superior to everybody else on Planet Dumb-dee-doo. Therefore, we argue that the exposure of Deep State power crimes over the last century is vital to the freedom and survival of the human species. To that end, we dare all journalists and news outlets to blow the cover of the Deep State by running stories of this covert history. We think the only way to get the Extreme Media (commonly mis-known as the mainstream media, as John Pilger pointed out) to publish and broadcast lead story retractions is if there is a counter-concerted effort by journalists, editors and producers in the Humane-Stream Media [HSM] (commonly mis-known as the alternative media) to report the unsanitized Truth. 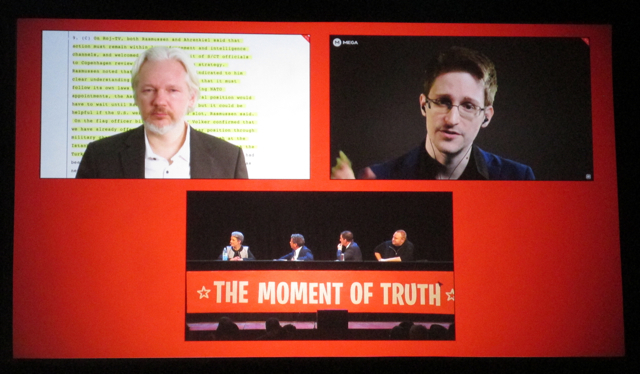 Moment of Truth: Edward Snowden told New Zealanders they are subject to mass surveillance, while Julian Assange described the Echelon Five Eyes partners as the Deep State’s surveillance apparatus (Auckland Town Hall, 2014). We also think a vital role can be played by trail-blazing news outlets such as The Intercept, to work in collaboration with the likes of RT.com, Global Research News, the VoltaireNetwork and Māori Television, by running such stories that expose the Deep States’ power crimes (that were sketched in “Missing News-action Action: Confronting Deep State Power Crimes“). Otherwise, we all face the prospect of co-creating a world run for the benefit of rivalrous psychopathic super-rich oligarchs and the sycophantic elites who serve them (like lifeless moons caught in their wretched gaseous orbits), by our in-action, our silence and our submission. If newsrooms of the West are not up to the task of confronting the Western Deep State criminal groups, then they need to acknowledge to their news audiences that they lack the balls and ovaries for the task, and are really just in the ‘profession’ to satisfy their clichéd egos.